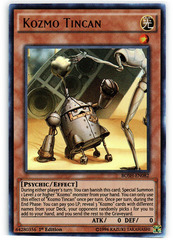 Card Text: During either player's turn: You can banish this card; Special Summon 1 Level 2 or higher "Kozmo" monster from your hand. 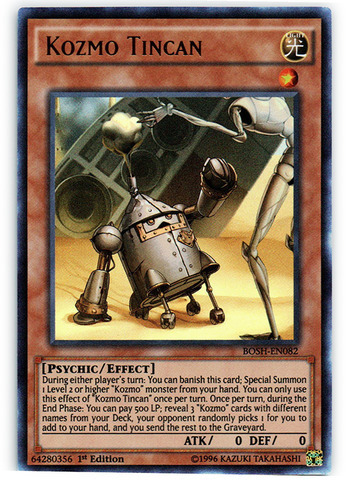 You can only use this effect of "Kozmo Tincan" once per turn. Once per turn, during the End Phase: You can pay 500 LP; reveal 3 "Kozmo" cards with different names from your Deck, your opponent randomly picks 1 for you to add to your hand, and you send the rest to the Graveyard.